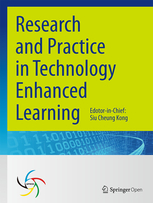 Research and Practice in Technology Enhanced Learning (RPTEL) commenced publication in 2006. RPTEL is the official journal of the Asia-Pacific Society for Computers in Education (APSCE). It was published three times a year initially by World Scientific Publishing Company (WSPC) from 2006 to 2010. From 2011 to 2014, RPTEL was published by APSCE online. Also, starting from 2012, with the full text license agreement with the EBSCO, RPTEL could be accessed via databases and services offered by EBSCO. Starting from January 2015, the journal is now published as an “Open-Access” journal by Springer. For the latest articles and the detailed information, please refer to RPTEL’s website at http://www.telrp.com. Herewith, we would like to express our great thanks to World Scientific Publishing Co. (WSPC), the previous publisher of RPTEL from 2006 to 2010, for allowing us to make all RPTEL papers published in Volume 1 to Volume 5 accessible at our official website. Past issues in Volume 1 to Volume 5 can still be accessed by subscribers at https://www.worldscientific.com/worldscinet/rptel. Examples and Tutored Problems: Is Alternating Examples and Problems the Best Instructional Strategy?